Generally speaking, there are two ways to land a job in the 3D industry. You can find work by who you know or you can find it by what you know. (Often times it's a combination of the two that actually seals the deal). Small, focused schools like the DAVE School and CG forums like ZBrush Central provide excellent networking opportunities to help with the former. But when you're blindly sending out copies of your demo reel in hopes of finding work, you'll be judged solely on the latter. For modelers, there are a handful of rules you must follow when putting your reel together. For example, you absolutely need wireframe renders of your work. You should have a mixture of hard-surface and organic models. You should include a text overlay indicating the number of polygons (or vertices) in your model. And of course, you should never show work-in-progress. Only the best work should ever make it to your demo reel. Beyond these simple rules, however, there are several things you can do to "plus" your reel and make it stand out from the pack. In this article, I'll cover five techniques you can use to make a better demo reel by harnessing the power of ZBrush 4.0. Every model on your reel should have a wireframe version accompanying it. 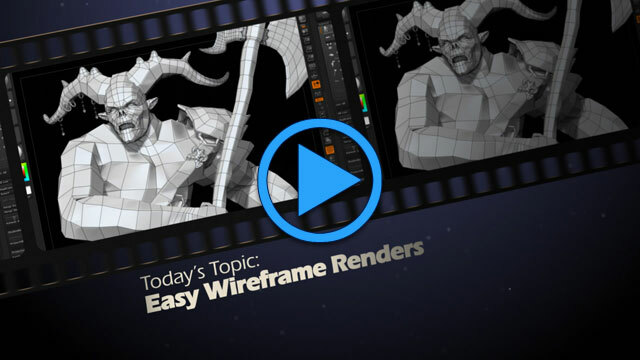 Wireframes show potential employers that you understand important concepts like edge flow, the "Rule of Three" and how to generate low poly cage objects which are essential for gaming and animation. I've spoken with a number of ZBrush users who think that the only way to get a wireframe image out of the program is to turn on PolyFrames, create a BPR render, then desaturate the image in a program like Photoshop. But there's a much easier way. Fill your object (including all subtools) with a white color and material. The SkinShade4 Material works quite well. And don't forget you can use the SubTool Master plugin (available on the Pixologic website) to automate the process of filling objects with color and/or material. Enable PolyFrames. You can do this from the interface or via the (Shift)+(F) hotkey combination. Now open up the Preferences | Draw menu and dock it to the tray We'll be adjusting several settings in the Draw submenu, so it will be helpful to have this docked when we make the adjustments. Set the PFill to 0. This will get rid of the random PolyFrame colors and ensure that the color we filled our object with (in this case, pure white) will show through. Turn Shadows off in the Render menu, then click the BPR button. Voilà! Professional quality wireframes right inside of ZBrush. As a rule of thumb, you should show off your wireframes on the lowest subdivision level to enable employers to see the base structure of your mesh. However this will prevent them from seeing the more detailed forms that only appear at higher subdivision levels. You can render wireframes at any SDiv level, but you might notice that as you increase the SDiv slider (or press the hotkey), the density of the wireframe increases as well. At the higher levels, this can make your object look totally black. To avoid this, follow these simple steps. In the SubTool menu, click the All Low button to set every Subtool to its lowest SDiv level. In the SubTool menu, click the All High button. You should now see your SDiv Level 1 wireframes drawn over the top of your high-res mesh. Do a BPR render with Shadows and Ambient Occlusion turned off. You may notice that the wireframes look faint or broken up. If this is the case, try lowering the SDiv level for each SubTool until its maximum poly count is under 200,000. In most cases, this will retain the overall form of the high-res mesh but still provide you with clean wireframes.